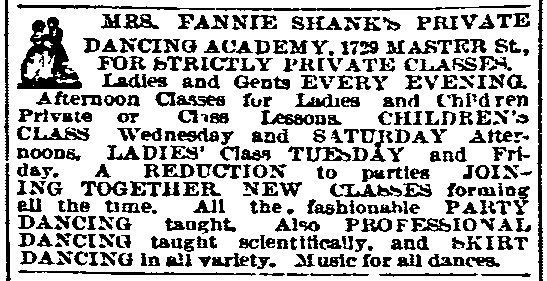 In 1889 and again in 1891, the London Gaiety Girls descended on Philadelphia. They were the girls of the chorus line from London’s Gaiety Theatre – polite, genteel, well-bred young ladies. They introduced Philadelphians to a novelty dance originated by one of their members, Miss Kate Vaughn; see photo right. Kate had costumed herself in a long, black, accordion-pleated skirt which she swirled about as she danced around the stage, creating with it images of voluminous silken butterflies, flowers and serpentine forms. Audiences were enthralled. “Skirt dancing” didn’t require years of ballet training and impeccable technique, it only needed a few dozen yards of silk, a lithe figure and some feminine gracefulness. Within a few years Miss Vaughn had spawned hundreds of disciples, variations and imitations in England and America, including Letty Lind, Mable Clark, Chrissie Sheridan, Chicago’s Annabelle Moore and Philadelphia’s own Bessie Clayton. 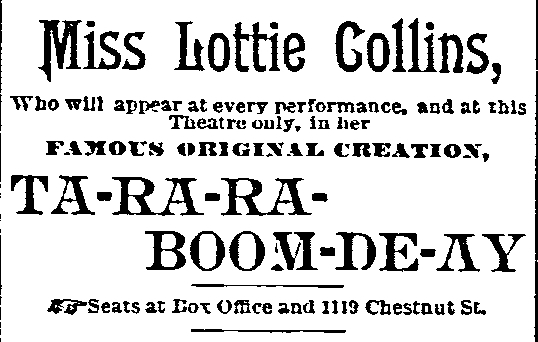 In 1892, Lottie Collins, left, appearing at the Walnut Street Theatre, brought the house down by adding a little bit of the naughtiness of the can-can, as she did her high-kicking rendition of the skirt dance to the immensely popular tune “Ta-Ra-Ra-Boom-De-Ay!” Depending on the venue, the skirt dance could supply enough artistry to satisfy the ladies and enough glimpses of leg to satisfy the men in the audience. 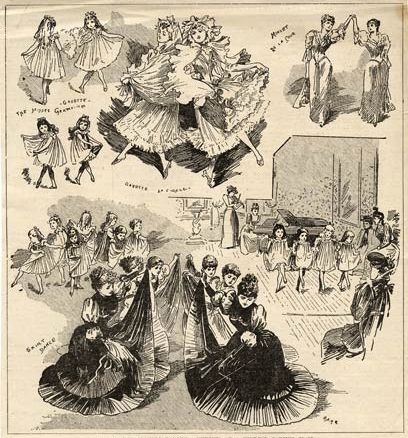 From about 1890 to 1910, skirt dancing was synonymous with dancing that was modern and artistic. 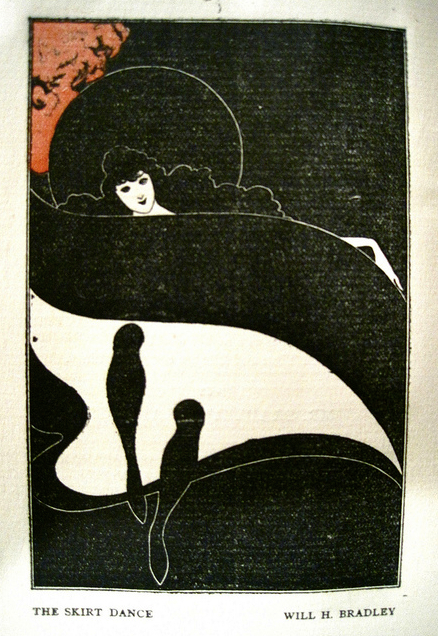 It captured both the spirit of the healthy, athletic, “New Woman,” and the aesthetics of the blossoming Art Nouveau movement, which celebrated the curving, sinuous lines found in nature; see William H. Bradley’s 1894 cover for the Chapbook entitled “The Skirt Dance,” below, right. “The muscles of the skirt dancer are so symmetrically developed that there is no touch of ungainliness about the physical form. The unattractive lumps that are painfully visible in the legs of the pirouetting French danseuse are replaced by the long slim lines that bend as gracefully as a reed. This was, perhaps, the beginning of the 20th century American obsession with the slim, athletic woman and the death knell for the Victorian idealization of the hourglass figure. 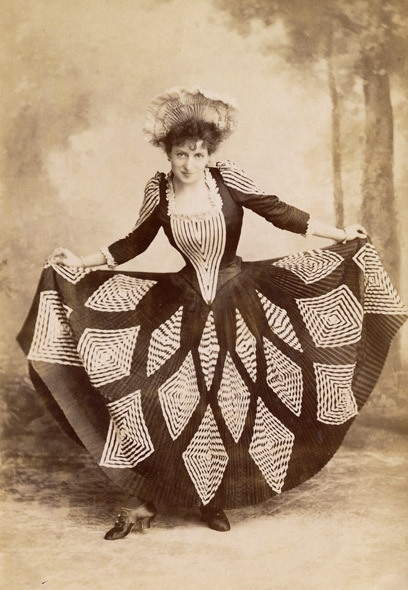 Fuller found her most responsive audiences in Paris, who called her “La Loïe” and she became the first American expatriate dancer. She returned to the U.S. on tour many times, however, performing to adoring crowds in Philadelphia’s Walnut Theatre and Chestnut Street Opera House. Fuller did something entirely new; she created a dance form that involved her entire body; she was entirely transformed into an abstract, evocative swirl of color and light. 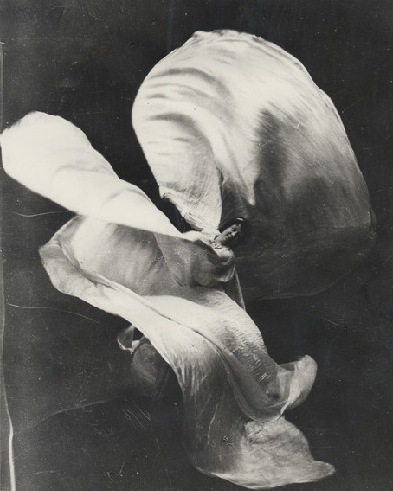 The effect was “unique, ethereal and delicious.” Before Ruth St. Denis and Isidora Duncan, whom she introduced to Parisian audiences, she abandoned corsets, danced in bare feet and trained a company of women dancers in her style. She lived openly as a lesbian in Paris for decades, continuing as a pioneer in both dance and technology. She proved that other types of dance than classical ballet could have an intense emotional impact and be perceived as serious art. 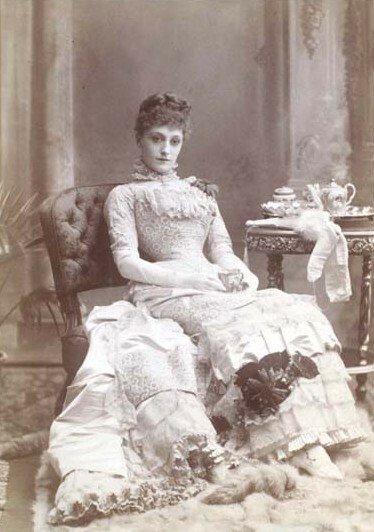 Her integration of music, movement, lighting and costume influenced theatre for years after her death. Fuller had opened the door to 20th century modern dance. The beautifully hand colored silent film “Danse Serpentine,” below, was made in 1896 at the Lumière Brothers studio in France. 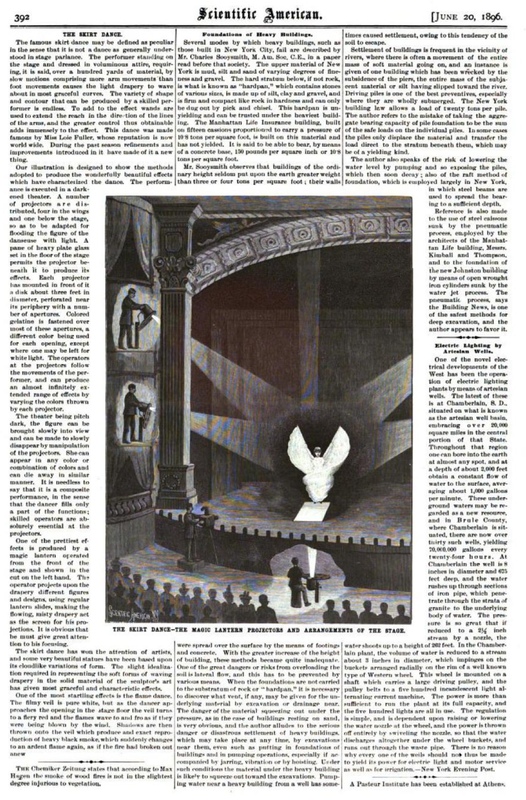 The identity of the dancer on the stage is unknown, but she comes closer to capturing the style of Fuller than some of the dancers filmed by the American Edison studio around the same time. Here’s an extraordinary picture of Loie Fuller wearing her serpentine dress outfit… the cloth for the dress must hang some 10 feet from her shoulders! Anita, since they were light, filmy and gauzy, Fuller’s costumes had to be repaired or replaced frequently from wear. Some of them used over 100 yards of silk!